An integrated 2.4 GHz X radio system is incorporated into the TT350O for wireless triggering. Able to be set up as a master or slave, this flash will help you create a versatile lighting setup with a range of 328' and support for 16 channels and three groups. It can also work with an optional X series transmitter for creating more elaborate setups. Box Dimensions (LxWxH) 6.6 x 3.5 x 2.4"
TT350O Mini Thinklite TTL Flash for Olympus/Panasonic Cameras is rated 4.8 out of 5 by 23. Rated 5 out of 5 by Terry from Nice flash for my Panasonic DMC-LX5! This is a great flash to use around our house, especially with our wonderful female cat! Upon first testing it I noticed that the zoom shown in the flash window was stuck at 14 but a Google search regarding this revealed that the wide panel and the catchlight were not pushed all the way in and once I pushed them to the farthest place in the top of the upper front and test zoomed my LX5's lens, the flash responded and the correction held! The LX5 I am now using was bought used, of course (since it came out in 2011), a couple of weeks ago here at B&H and I treasure it, too. Both the Godox and the LX5 have increased my joy in photography which I have had since the 1950s! Rated 4 out of 5 by Benjamin from Great beginner flash! This is my first flash, for use with Panasonic G7. The compact size is great for the small body of this camera, and it seems to be quite powerfull, I generally use it under 1/2 power. TTL mode seems to be functional, though I prefer Manual mode. Some cool features are the multi flash, and optical sync mode for off body use. One day I might add a couple bigger Godox flashes to use as remotes to this one, but this is more than enough for me now. Build quality seems very solid, and the included accessories are good to have (though not great, the case doesn’t have a belt loop!?!) TLDR: great beginners flash and entry point to godox wireless. Rated 5 out of 5 by Robert from Stop Comparing; Just Get This One If you are looking for a flash for your MFT camera, this has what you need, at a price you can't beat. Small size so the camera with flash is not top heavy. TTL operation works (I have a G9). Zoom (this is manual). Only two batteries needed (and you can use rechargeables). Comes with a stand for use as a slave, diffuser dome, and has a pull out catchlight card and wide angle filter. Heads tilts so you can do bounce flash. When you get more advanced you can use the flash as part of a master/slave setup. You can put the flash into a strobe mode to take pictures of moving objects (golf swings, pendulums, etc.) High speed mode for syncing fast shutter speeds (an advanced feature really useful for fill flash in daylight outdoors when you want a shallow depth of field). Rated 5 out of 5 by Steve from I like it! As a flash for the MFT system it fits the bill: not too big ("size appropriate"), powerful enough to fill a normal room even though only powered by 2 batteries. It even comes with a case and a diffuser - a nice bonus. The diffuser, like almost all of them out there, falls off easily after a couple of uses, so plan on using tape to keep it permanently attached. For the price you get TTL, swivel, bounce, and a whole bunch of easily implemented options. I would buy this again. Rated 4 out of 5 by Bill from Great "little" flash for Panasonic G85 I was looking for an off camera flash that kept in the same size range as the main camera body. This flash fit that description. It literally fits in the palm of your hand. Comes with case, diffuser and small stand. Don't expect it to provide the same flash strength as a full size off flash but does do a better job than the pop up flash. As a footnote to this the G85 pop up flash can act as a trigger but make sure the setting are right on the camera and the flash is set to S1. Rated 5 out of 5 by George from Works great with GX85 - replaced my FL36 Been looking for a new flash to replace my Olympus FL36 and this fit the bill. Same power, smaller, good build quality, supports HSS and best of all - works wirelessly with the rest of Godox product lines, and GREAT PRICE! Rated 5 out of 5 by Nicholas from Great flash. This was my first ever external flash purchase, so I don't have much to compare it to besides the flashes built into various cameras I have owned. I really like this flash. It is small but powerful, and I can shoot about 1 photo per second (maybe a little faster) using the Panasonic rechargeable lithium batteries I also bought. I like that the flash comes with a padded bag too. This flash has been a great companion for my Panasonic GH5 camera. Another thing though - with this flash I also bought the Vello Mini Softbox which I think costs less than $10, and that has been mandatory to attach to the flash for people photography. My human photography subjects only look attractive with the Vello Mini Softbox attached to this flash. Since the Vello was so cheap, and I've had no issues with this flash, I'm giving it 5 stars. Rated 5 out of 5 by Hobbyrx from LX100 perfect match! Small. Godox has a great system that can be expanded. Perfect Everyday Carry Camera Bag: LX100, TT350O, Eneloop, ND filter, Peak Design Strap, Flash cable, Magsphere, Pacsafe man purse. 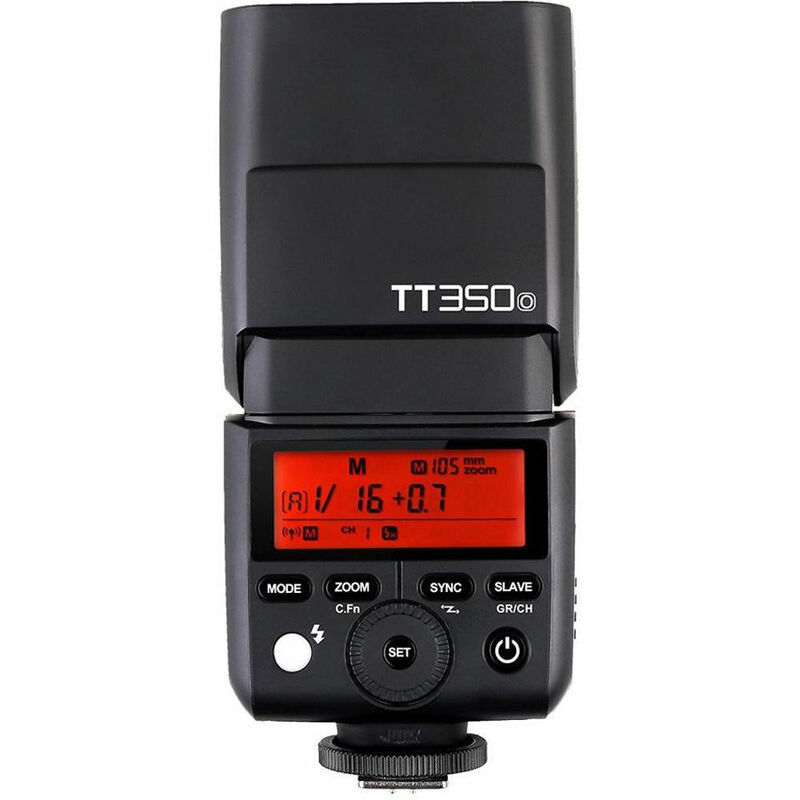 The TT350 matches well for the discreet strobists among us. A timely release by Godox for smaller Micro Four Thirds, Mirrorless and Enthusiast Point and Shoot cameras. Negative: understandably weak power compared to full sized speedlites. Can this flashe control itself providing that there are two flashes used, one as master and the other as slave? Yes, this flash has Master/Slave functionality and with two of them one would be able to control the other wirelessly. Will this work with the OM-D E-M10 Mark Ill? Godox website compatible camera model list includes E-M10ll but not E-M10lll. Yes, this will also be compatible with the Olympus O-MD E-M10 III. Will it work with a GX-1? Sorry I do not have the GX-1 so I could not give you a definitive answer, you could ask the manufacturer if it works. is this flash for Panasonic works with Leica Q with manual mode ? Yes, it will work in manual mode with the Leica however TTL cannot be used. Will it work with panasonic gx-7? Yes it is compatible with the Panasonic Lumix GX-7. Will the Godox TT350O work with the Panasonic FZ200? Yes, the flash is compatible with the FZ200. Can this work on old GH2? It will flash on the GH2 with TTL. I bought one for my new GX9 and it worked right out of the box, even though it wasn't specified for that camera. It also worked on my LX100, which was of the same generation as the GX8. I was told that if it didn't work, I could update the software and it would work. I didn't have to try this. B&amp;H have a good return policy, so I would say to give it a try.